Tessa Longbons | May 3, 2018. The most recent statistics published by the Virginia Department of Health show that abortion in the state is falling. Virginia releases its abortion data in three separate reports: an abortion report, a report of abortions by facility, and the state vital statistics report. *Information on Virginia’s chemical abortions in 2015 is not publicly available. Planned Parenthood’s 2015 Virginia market share is presented here to allow for comparison with other Virginia abortion trends. According to Virginia’s report of abortions by facility, 18,662 total abortions were performed in the state in 2015. Total abortions fell by eight percent from 2014 and by 32 percent from 2009, the first facility report. 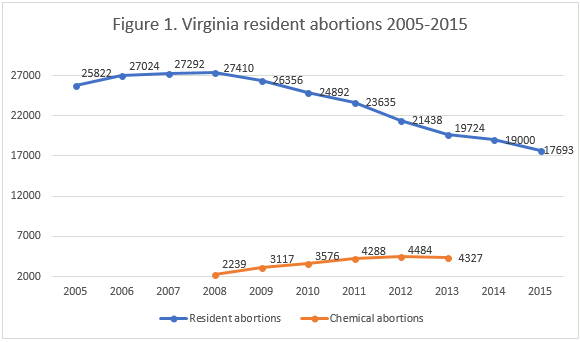 Virginia’s abortion report shows that resident abortions are also declining. In 2015, 17,693 Virginia residents underwent abortions in Virginia, a drop of seven percent from the previous year, when 19,000 abortions were performed on residents. Resident abortions fell by 30 percent from 1995, Virginia’s first reporting year. Virginia’s resident abortion rate for 2015 was 10.5 abortions per 1,000 resident women ages 15 to 44, down from 11.3 in 2014. The demographic information that Virginia has published for 2015 is for resident women only. At 44 percent, black women composed the largest racial category, even though black women made up only 22 percent of the state population of women of childbearing age in 2015. By contrast, white women underwent 42 percent of abortions while making up 68 percent of women of childbearing age. Women of other races underwent 14 percent of abortions and made up nine percent of the population. A large majority of women, 86 percent, were not married. 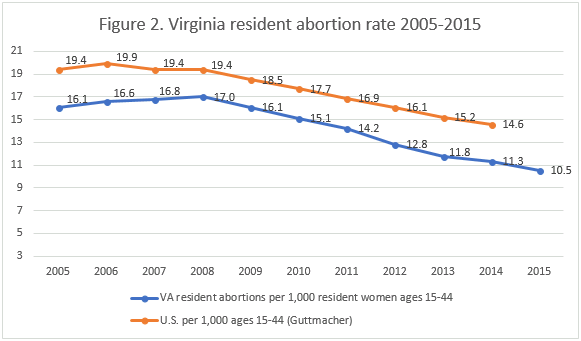 Information on the ages of the women getting abortions is published in Virginia’s full vital statistics report; however, Virginia’s most recent vital statistics report is for 2013, and numbers for 2015 are not yet available. Virginia is one of only five states – along with Alabama, Indiana, Massachusetts, and Minnesota – to report how many abortions occur at each abortion facility in the state. Virginia’s facility report is more recent than its abortion report and vital statistics report and contains data for 2016. For the first time, the annual number of abortions performed by Planned Parenthood’s Virginia centers declined. Planned Parenthood performed 6,431 abortions in Virginia in 2016, down 11 percent from the year before. Planned Parenthood’s market share fell from 38.8 percent in 2015 to 37.7 percent in 2016. This decline was probably caused by the closure of two of Planned Parenthood’s abortion centers, with one closing in December of 2015 and the other closing in February of 2016. However, a different Planned Parenthood center began performing abortions in late 2017, and this likely will be reflected in future facility reports. Planned Parenthood is still the largest abortion provider in Virginia. Across the country, while abortions continue to decrease, Planned Parenthood’s market share of abortion provision is growing. In 2015, Planned Parenthood performed more than 35 percent of all abortions in the United States. Virginia’s reporting tied for 29th best in a CLI study of abortion reporting across the 50 states, the District of Columbia, and New York City. Virginia could improve its reporting by releasing data more regularly: the state’s most recent vital statistics report, which contains the most comprehensive information, is for the year 2013. Virginia could add to its abortion reports information that it already collects, such as mothers’ levels of education and number of previous pregnancies and the gestational ages of the children killed by abortion. Virginia could begin collecting and reporting women’s reasons for abortion and their contraceptive histories as some other states do, as well as whether abortions result in complications. Virginia requires that informed consent and parental consent processes must be followed before women undergo abortions but does not report whether there were any exceptions to these requirements. By including more information and releasing reports more quickly, the Old Dominion could make its abortion reporting a more useful tool to citizens and researchers tracking abortion trends in the state.